So you’ve been looking for a new hobby that you can take up and you’ve finally settled on quilting. Now you’re itching to get started but you don’t what to do first! Now, like any new hobby, you will need to invest in some new tools so that you can begin your journey. The following list may not be as comprehensive as others, but they are essential to ensuring that you can begin with ease. You don’t need to go overboard with buying materials, just the basic ones and you’ll still be able to produce a quilt. Sewing machine – out of all the tools and materials that you will need, this might be the most expensive investment you will make unless of course, you wanted to start with hand quilting. But if you want to get into the hobby easier, it’s better to use the sewing machine. Be meticulous with your choice of equipment. There are so many models available in the market and you want something that’ll last for years. That’s not necessarily the most expensive model in the market. Do your research, ask fellow hobbyists and go to forums to find out which sewing machines is the best one to buy. Quilting fabric – it’s better to start your quilting journey with some high-quality quilting fabric. This way you won’t encounter problems like puckering or a fabric slipping while working on it on the machine. It would also be good to buy basic quilt patterns as your guide. Once you’ve mastered the skill, then you can begin to deviate from the usual patterns and just create your own. Pins, thread, and needles – it’s a given that you would need the three to finish a quilting project. More than likely your sewing machine will come with some standard sized needles that you can use. You can also purchase some hand needles and specialized quilting needles. The former is for when you will need to patch up some holes and the latter is for when you will put all the layers together. WIth threads, go for those with high quality so that you know that your quilt will be well-made. Rotary cutter – when you cut the fabric for the quilt, it is very important that you are able to achieve perfectly precise cuts. 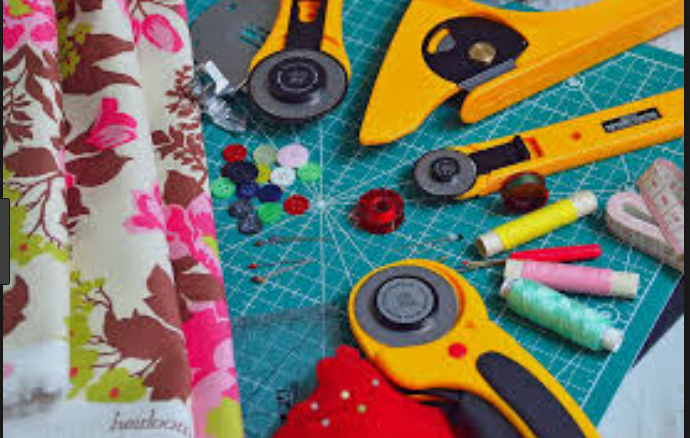 A rotary cutter, which may look like a pizza cutter at first, is the perfect tool to make the cuts on your fabric as its blades are very sharp. And because they are sharp, sometimes they can cause injuries so as a beginner, purchase the type that has a safety clasp or a way to close it so that you won’t be afraid to just leave it on your work table. Self-healing cutting mat – hand in hand with a rotary cutter is a self-healing cutting mat. Not only will it make sure your surface will be free from scratches and cuts but it can also help maintain the sharpness of the blades.